This summer we were privileged to have Hugh Randall as an intern in our studio. Hugh is a local high school student who approached our studio eager and excited to spend some time learning about the history of glass and how it is used today as an art form. After hours of research and hands on application, he presented and allowed us to share his paper through our website. Read on and enjoy learning about the history of glassmaking tools and how they are used today. Thanks Hugh & good luck! Making and working glass has been one of the greatest advancements in technology up to the modern age; and has greatly influenced our way of living. When glassmaking was first invented in Mesopotamia around 3,000 BC, people were using primitive methods to make glass pieces. The Mesopotamians had discovered a material that would provide new art, style, and better ways of living. There was so much beauty, so much potential, that at first they kept it a secret. Inevitably, word got out. Though the technology has evolved, the tools of the craft of glassmaking are fundamentally unchanged since ancient times. An important influence in the tools of glassblowing are the methods developed that require the use of these tools. The earliest method used to create glass pieces is called core forming. Core-forming involves a sand/clay core that is wrapped in glass (3). The core is formed around a rod called a pontil. Among several techniques used in core-forming, trailing was the most popular way of applying the glass to the core. In this method another pontil was used to gather glass and wrap it in strands around the core. Then the glass was distributed evenly around the core with a paddle. The glass was also marvered: rolled on a flat table, to achieve cylindrical form or to correct the position of the glass. Once the main process was over, a separate gob of molten glass could be touched to the glass and then stretched with tweezers to a second connecting point to form a handle (4). After the glass had cooled, the core was chiseled out and the glass exterior was polished using a sandstone or pumice stone. (4). The tools used in this early method (such as pontils, paddles and marvers) are still in essence a huge benefactor of glassmaking. Glass at this point was laborious to make and costly, and so new methods were developed that make glass more broadly available. Slumping, a method that involved draping the glass into or over a mold sped the glassmaking process considerably. Most importantly it removed the need for a core. Core forming was not forgotten; as it was still being used around 30 BC (2). An important method of forming the glass, called casting, was developed along with the invention of the blowpipe. Casting allowed the gather of glass to be lowered into a mold, and be blown to take on the mold shape. This method was made possible by the invention of the blowpipe. The blowpipe is said to be 'one of the most significant advances in the history of industry…' (1). It may have been discovered around 1 BC (2) by a Syrian glassworker, who found that if one blew into a hollow pipe toward the glass gob on the other end, the glass would inflate. This revolutionized glass forever, changing the term 'glassmaking' to 'glassblowing' and allowing glass to be made more easily than ever. The first blowpipes were made out of hardened clay, because it was the easiest material to come by (5). During the 4th century BC there were iron pipes made (6), and eventually copper pipes. These pipes were only good for several uses because the material couldn't withstand high temperatures without deforming. These days we use materials that can stand up to the heat and wear that accompanies the glassblowing art. Manufacturers use steel as a base for all of their blowpipes. A lot of consideration and re-engineering has evolved the blowpipe so that it may overcome any problems while in use and stay the heart of all glassblowers. One very important type of steel used is called D2 steel. It is produced by air hardening a mixture of high carbon/high chromium steel. Its properties include resistance to wear, corrosion, and extreme heat (7). So as you can see, there is a lot that can go into a single tool. Another still important tool is the previously mentioned pontil (or punty). This tool is special because it works closely with the blowpipe. The pontil is a long solid or hollow rod used to hold a piece during the finishing process (10). Pontils are one of the first tools used by early glassblowers, and today they still hold significance. They are very capable tools and similar to the blowpipe, but are generally not blown into. A primary use of the pontil is to transfer glass pieces. The transferal of glass is a vital process, and it can be very dangerous if performed wrong. There are two instances where a transferal will be used; during the middle and at the end of the production. When making an open-mouthed object, like a cup for example, a punty is attached opposite the blowpipe so that the blowpipe can be cracked off and the piece opened up. Once a piece is complete, it is then cracked off of its pipe onto a cushioned surface so that it can be annealed. If the transfer or cracking off is done wrong the piece could shatter or leave a deep scar. There are several residual effects of removing a punty that have been recorded throughout the ages. The types are bare iron, sand covered, and glass tipped; each leaving their own unique scars (11). Glass tipped is the most prevalent type today, because the scar can be easily removed by reheating and smoothing. 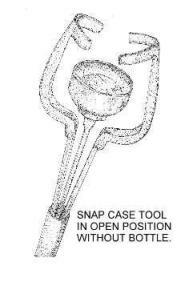 In the year 1697, Europe invented a tool called the 'snap' that removed the scarring issue altogether (12). A snap is a kind of punty for working the neck on bottles, with a cup to take the base of the bottle and arms with curved grip ends to hold the neck (13). The design allowed the piece to be removed with no residual effects (compared to the use of a pontil), because the piece was solely resting in a 'cradle'. There were many attachments for the snap so that it could handle different sized pieces (12). The snap had mostly replaced the pontil during the 1850's, but both are equally used today. A company called Arrow Springs produces its own line of snaps, with the patented name 'hot fingers' (14). The oldest tools are basic elements that are essential to the formation of the glass; the human eye and gravity. The human eye is the most important tool, able to identify the temperature of the glass, tiny imperfections, and to hold the vision of the finished piece. The eye is also important because it can observe. Observation has been used when attempting to learn the craft, but also in the old days as a 'spy technique'. When somebody wanted to know how things were done elsewhere, they had people go and carefully observe a process and bring back the knowledge to be explained. This is how many countries learned the art and methods of glassblowing. Another very important tool is gravity, and every glassblower tries to use it to their advantage. It is necessary to keep the glass in its center of gravity before tooling it in any way. Gravity also allows the glass to be drawn out to a desired form and provides dynamics in the process. 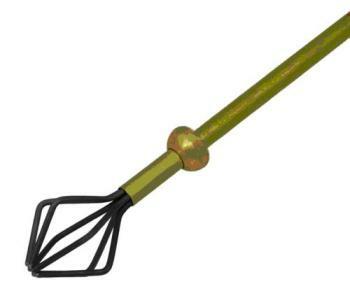 The next is a physical tool called a marver. This is a table made for rolling the glass to achieve cylindrical shape, to re-position the glass on the rod, or to collect extra glass for decoration. Marvers were first made from a flat slab of marble, and was later on made of graphite or a metal (most commonly steel) (5). Graphite and steel are used because of their heat tolerance (9). Forming blocks are made to spherically shape a gather of glass (Fig. A). Walter Evans, owner of the Cherrywood Mold Shop in Kenova, WV (15), made the best wooden tools for glassblowing until he retired and passed his knowledge on to his successor Gary Guydosh, who runs Hot Block Tools (16). Gary has kept up Evans' tradition of using Black Cherry wood in all of his pieces. This wood is chosen for its tight, even grain which holds in water much better than other wood (9). The tool itself must be water- logged to be kept in constant use or else it will crack. Paddles are thin blades with handles (Fig. B). These have also been used since very early glassmaking methods were established, like in the core-forming method to spread the glass about the core evenly. This very simple tool can be used more craftily nowadays; to fashion as a heat shield to protect delicate hands, or to gently flatten the rim of an object. Thin metal-bladed paddles are a traditional Italian type tool (9), but they are also made out of graphite and wood. Newspaper can be used as a close-up hand tool that acts as a forming block. The newspaper has a high heat resistance if it is folded correctly and if it is constantly damp. The newspaper must be folded 4-5 times to provide ample distance between the glass and your hand. It must be damp at all times so that it doesn't catch on fire when applied to the glass. There is a legend that NY Times newspaper is the best for this purpose (9). The Jack is the most versatile and important hand tool (Fig. C). A jack is a hairpin shaped tool that springs open and has long blades that are parallel about 12-15" long used for shaping glass (9). Wooden tipped jacks are best for reaching deep into a piece without damaging it. Also, wooden tipped jacks do not draw as much heat from the piece as steel jacks. For this reason wooden jacks are often used when the glassblower needs to work the piece longer and needs to sustain the heat of the piece. This tool can be used effectively by a skilled artisan, who can utilize every side and shape of the tool. The best jacks are made by Jim Moore (8). Tweezers are exactly what they are, tweezers (Fig. D). They are long, widespread tools with bent tips for better grip (9). They are used for delicate maneuvers. This tool was most likely adopted from another craft or was manipulated from a household item. Shears are used to cut gobs of glass off of a piece or to guide a pontil into place (Fig. E). Shears are useful when a bubble must be removed from a piece because it can draw out the designated section of glass to be cut off. They most likely evolved from early sheep shears that share similar design. Diamond shears are designed to cut off the large amounts of glass, and straight shears are meant to cut linear lines. Straight shears are equivalent to scissors, which are another tool used by glassblowers (5). A forming tool is similar to a wood jack in looks and in purpose, but forming tools are generally for more delicate work, like gently shaping the stem of a goblet. Jim Moore (8) and Carlo Dona (17) are two of the leading manufacturers of glassblowing tools today. They offer a wide selection of the best glassblowing tools. Specifically, Moore's jacks and Carlo Dona's blowpipes are some of the best in the market. Dona stands firmly behind his families' legacy of "offering tools whose designs have been refined by the world's best glass blowers for over 80 years." (17). Both Moore and Dona have built everlasting tools that have been tailored to satisfy the artisan and the improvement between their tools and that of ancient times surely show a 'state-of-the-art' transition. Another important factor that has certainly changed glassblowing throughout the ages has been the development of the furnace. The furnace is used to melt the glass and to keep it at a workable temperature. The earliest furnaces were made out of clay and were heated by wood. The furnaces would've been built next to a large fuel source (in this case heavily-wooded area), because it could not operate elsewhere. There were workers whose job it was to fuel the insatiable furnace. This job was very important because the workers needed to know just when to add wood to keep the temperature consistent (18). Thomas Percivall invented a furnace in 1615 that could be fueled by coal. His invention was badly needed at the time because all of the wood being used to run the glassblowing shops was being put towards England's naval armada. Coal was able to heat up to higher temps more quickly than a wood-fired furnace, which reduced the attention that the previous workers gave when hand-feeding the wood (18). When glass was being brought to the New World, early James Towne (VA) workers incorporated a separate furnace in their glassblowing process. This furnace, called the 'fritting oven' was used to pre-heat a batch of glass before being dumped into the main furnace. These furnaces were discontinued after a time to streamline the glassblowing process (19). There were quite large furnaces made, especially in the 1900's because of industrialization. One example, found as a model in the Corning Museum of Glass, is a 16-pot furnace. This was a gigantic dome-shaped furnace that contained 16 crucibles that contained sometimes different batches. The crucibles contained 800-2000 lbs of glass, heated by the furnace at nearly 1280 degrees centigrade. There were teams operating at each entrance to the furnace all the way around (2). This is a more recent example of large-scale production that was not mechanized. The furnaces that are manufactured today are built in consideration of many aspects. They are not only built to heat up the glass, but engineered to be efficient, safe, and durable. John Chiles; a long time glassblower and equipment maker, has built some of the most efficient furnaces around today. His oldest furnace, built 20 years ago, is still working just as well as when it was first installed; along with every furnace that he's sold since (20). He stands by his work with confidence and pride. The design of a furnace starts from the inside out (19); starting with the crucible out to the fire-bricks and to the steel frame that supports the furnace. John is able to cast almost any size furnace in his shop. He provides his customers with molds to cast new size doors, a guide for maintaining the equipment, and a wholly inclusive instruction manual (20). This makes for a more versatile product that ancient glassblower would never have dreamed of. The general layout of one of his furnaces starts with the interior size based on the size of the crucible. Then there is a layer of fire-brick, with 10" of 12-lb high alumina insulation backing it. The excess amount of insulation makes for more efficient heating. Also the interior has a refractive surface that bounces the hot red-waved particles inwards, allowing for more efficient heating. Following the alumina insulation may be blocks of heat-resistant insulation; all wrapped in a cast high-temperature concrete case. Everything is supported by a 2" steel frame (19). One neglected important factor is the combustion and safety systems on the furnace. These systems are important when operating the furnace, and among other things they regulate air and gas input, controls the temperature… (20). John also makes glory holes, also called reheating furnaces. He mentions that glory holes have only been around for 35 years; and that furnaces doubled as glory holes when glassblowing was still young. His glory holes also provide excellent insulation for maximum efficiency, and operate on separate burners from the furnace so you can shut one system down and not the other (19). The last step of a glassmaking process is done in the annealing oven. The annealing oven is used to bring a recently finished piece slowly down to a workable temperature. The temperature starts at 1000 degrees Fahrenheit and is lowered to about 400 degrees to remove stresses developing in the pieces that had been cooling outside of the furnace during production. If the pieces were not annealed, they would shatter. An early method of annealing was to bury the piece in sand until it could be handled safely (9). All of this big equipment is being built with efficiency in mind, in comparison to the early days of glassblowing when they concerned themselves with just getting things up to temperature. Using fundamental laws and modern technology, we've come up with new efficient equipment; like the electric appliances. Electric furnaces (22) and glory-holes (23) are in the future of glassblowing. They are built with quietness and consolidation in mind. But comparatively, current propane furnaces will still be around for some time, because of the superior circulation within the furnace that the electric furnace cannot match yet (19). Parallel to the blowpipe having a huge effect on glassblowing, glass has changed largely with industrialization and our basic understanding of chemistry. Glass was first industrialized by Edward Drummond Libbey in 1888. He started his factory in Toledo, Ohio and named it the Libbey Glass Company. The factory specialized in fine-cut glass (18). When Libbey was successful enough, he decided to invest in a new idea proposed by Michael J. Owens; a good friend and employee of his. He built an invention that could produce a large amount of molded glass pieces in record time. It was called the Owens Bottle Machine. His machine worked, and Owens success was deemed the 2nd major victory in the history of glass industry (18). Owens Bottle Machine comprised of a main vessel that contained a large pot of molten glass. The machine had 15 rotating arms, each with an identical mold built in. The machine would insert a measured gob of glass into the mold, and then the glass was air compressed to fill the mold. In this fashion, Owens' machine could produce 1,000,000 bottles every week! (18). Figuratively, making 450 bottles by hand would take 6-hours. Comparatively, Owens' machine could make that many bottles in 15 minutes and with today's machines 7 minutes (2). Industrialization has been both a great thing and also a bad thing. It is a bad thing because it drew away from the artistic glass scene for a while, making it harder for off-hand glassblowers to make a living. But at the same time, it provided the world with much cheaper glass, opened up lots of factory positions on the floor, and during the 20th and 21st century glass became such a huge part of our daily lives that the demand can't be met any other way. In this modern age, glass is in a good balance between 'industry' and 'hand made'. The factories produce the glass that we use everyday, and the off-hand glassblowers are still able to produce beautiful art and make a living. In 1962, The Studio Glass movement, started by Harvey Littleton and Dominick Labino had gotten individuals into shops of their own where they were able to melt and create glass their own glass (5). This movement has inspired people internationally to get into the groove of glassblowing, making one-of-a-kind pieces that would only be possible with the developed tools we have today (2). Now it is the 21st century, and the glass industry is booming. With large scale productions and small scale wonders, new pieces are being created every day for practical uses and for extraordinary purpose. The glass artisans have inherited the best tools to create the most spectacular art that humans have ever seen. When we look at a glassblower today, we can see 4,000 years of history: in their eyes, right down to the very tools in their hand. (2) Randall, Hugh G. Self-conducted tour; notes taken. Corning Museum of Glass. Corning, NY. November 22, 2009. (4) Taylor, Mark, and David Hill. "Roman Glassmakers Newsletter 7." Roman Glassmakers Home Page. Jan. 2005. Web. 30 Nov. 2009. <https://www.romanglassmakers.co.uk/nl7text.htm>. (5) Wikipedia Foundation Inc. "Glassblowing -." Wikipedia, the free encyclopedia. 13 Nov. 2009. Web. 28 Nov. 2009. <https://en.wikipedia.org/wiki/Glassblowing>. (6) "BLOWPIPE. Early glass blowerÃ?s pipe of cast iron." Antiques, Art and Collectibles - What's it Worth? | WorthPoint. Web. 28 Nov. 2009. <https://www.worthpoint.com/worthopedia/blowpipe-early-glass-blowers-pipe-cast-iron>. (7) "D2 Tool Steel." D2 Tool Steel. CRS Holdings Inc., 1 July 2000. Web. 30 Nov. 2009. <https://cartech.ides.com/datasheet.aspx?i=103&e=263&c=techart>. (8) Moore, Jim. Jim Moore Handcrafted Glass Tools. 2009. Web. 30 Nov. 2009. <https://toolsforglass.com/>. (9) Firth, Mike. "Glossary of Tools & Equipment for Glassblowing." Transfer file index.htm to start.htm. Web. 30 Nov. 2009. <https://mikegigi.com/glostool.htm>. (11) Lindsey, Bill. "Pontil Scars." The Society for Historical Archaeology. 14 Nov. 2009. Web. 28 Nov. 2009. <https://www.sha.org/bottle/pontil_scars.htm>. (12) Lindsey, Bill. "Bottle Bases Page." The Society for Historical Archaeology. 18 Nov. 2009. Web. 28 Nov. 2009. <https://www.sha.org/bottle/bases.htm#Snap%20Case%20&%20Sabot>. (13) Firth, Mike. "Glossary of Tools & Equipment for Glassblowing." Transfer file index.htm to start.htm. Web. 30 Nov. 2009. <https://mikegigi.com/glostool.htm>. (14) "Arrow Springs Holding Tools." Arrow Springs' Home Page. Web. 30 Nov. 2009. <https://www.arrowsprings.com/html/holding_tools.html>. (15) "Glassblower.Info - Cherrywood Mold Shop - Kenova, WV." Glassblower.Info - Glassblowing Information, Photos, Videos. Web. 30 Nov. 2009. <https://www.glassblower.info/one.php?id=cherrywoodmoldshop&map=no>. (16) Guydosh, Gary. Hot Block Tools. Web. 30 Nov. 2009. (17) "About Carlo Dona Tools." Spiral Arts. Spiral Arts Inc., 2006. Web. 02 Dec. 2009. <https://www.spiralarts.com/about/about-cd.asp>. (19) Diamond, Freda. The Story of Glass: Glass in the New World. Harcourt, Brace and Company, NY. 1953. P. 59-60, 82, 84-85. (20) Hot Glass Blowing Tools, Equipment and Supplies - HUB Consolidated. Web. 04 Dec. 2009. <https://www.hubglass.com>. (21) "John Chiles Interview." Personal interview. Dec. 3 2009. (22) "Glass blowing equipment - Furnaces - Denver Glass -." Denver Glass Machinery, glass working equipment for the professional. Web. 01 Dec. 2009. <https://www.denverglass.com/furn.html>. (23) "Electric Glory Hole Specifications." At Electroglass we manufacture state-of-the-art, electric, glass melting furnaces, fusing kilns, electric glory holes, and annealers. Web. 30 Nov. 2009. <https://www.electroglass.com/gloryholespec.html>. "I'd like to thank my mentor Michael Egan for granting me the privilege of working with glass in their shop, and for Michael's close guidance throughout my project. They are a great team and I have learned a lot from both of them."